Summertime is almost over. College students are returning to school… some of them having just completed an internship in their fields of interest. One such student (and equestrian), a sophomore from Bryn Athyn College, named Ahmai Cole walked into my office with her mother, a bit shy, but full of enthusiasm to learn more of our mission. After taking a tour and seeing firsthand our behind-the-scene operations, Ahmai’s creative pulse was raised. As a matter of fact, I received an email from her mother that very night, “Ahmai left quite inspired by our visit and excited at the thought of doing an internship with Impact Thrift. She left wanting to major in business so that she can run a thrift store for horse equipment.” I thought, “WOW”, this internship is off to a great start! My first week started with an orientation. I then had the opportunity to work in the Bric-A-Brac department. My experience was that it was like Christmas, you open boxes that have unknown content, some of which is interesting and unique. The whole department was friendly and helpful. This made my first two days at Impact very memorable, and fun. Week four involved working at Manna on Main Street one of the charities that Impact financially supports. Manna is a soup kitchen, pantry and offers emergency aid. I got to see how a soup kitchen works and participate in the serving. I then helped organize packets for a walk they are hosting, along with working in the pantry, for an hour. I was impressed with the facilities, and hope to visit again sometime soon. What is coming up? 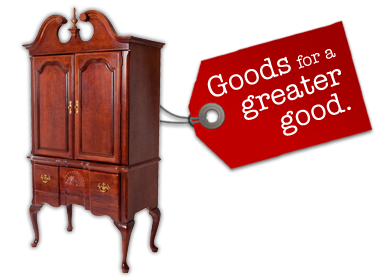 I am working on a project for their Impact LIVE program; which is a community service program that Impact Thrift provides to local school districts. The students actually get to learn how to organize a collection drive to support families in need. I am excited for all that is to come! 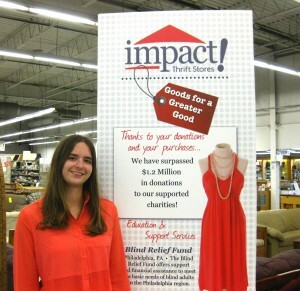 Click here for more info about Internship possibilities, Impact LIVE or how you can get involved with Impact Thrift Stores and our supported charities. This entry was posted in A Day in the Life, ImpactLIVE, The Big Picture, Uncategorized and tagged Ahmai Cole, collection drive, donate to Impact Thrift Stores, donation drive, Impact LIVE, internship, shop thrift, support charity, Tamika Miller, volunteer. Bookmark the permalink. ← Back to School… Impact Thrift Style!